Recently, I’ve heard people raise this question: “What’s better for email marketing, text or HTML email?” To tell you the truth, I thought this debate was done and settled—like way settled—but it appears I’m mistaken. Let me break this down for you: it’s no longer 1994. We’re not dialing into the Net using 14.4kbps modems, we’re not using early versions of Netscape to surf the web, and we’re not reading our email through a PINE terminal. Forgive the tongue-in-cheek, but look around: we’re living in the Star Trek age! 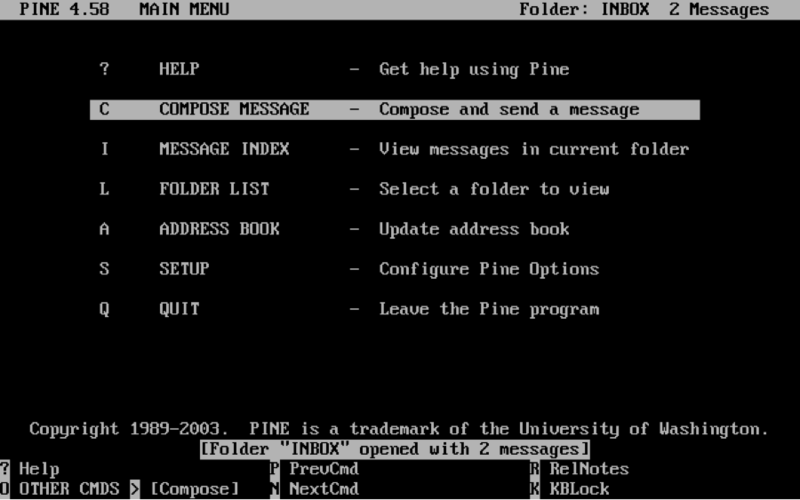 Our tricorders called smart phones fit in our pocket and have far more horsepower than the once-state-of-the-art Unix box used to run the PINE client below. Even so, let’s run through some of the most common canards. I bet you’ve heard some version of these. Why is it false? You’re assuming that the payload of the message is the only thing that an ISP or mailbox provider uses to filter the message. Content is one part of a complex filtering schema that includes the sending IP, domain, previous history, personal user settings, internal and external blacklists and blocklists, and more. Plain text emails are not the solution to deliverability problems—establishing a good sending reputation and following best common practices is a much better approach. And if all else fails, you should default to the idea that sending engaging email to individuals that want to receive it is the best and only solution. The claim: I get B2B emails from reps that want to reach out and block time on my calendar—these are personal messages and are very engaging. Why shouldn’t my email marketing be the same? The notion that reps using automation such as Tout or Salesforce send you text emails couldn’t be further from the truth. If a rep did that they’d have no clue if you opened an email or not. Text emails can not be seeded with a tracking pixel—what you think are text emails are actually HTML emails with very minimal formatting and no images. These messages have been styled to look like text to make you think they’re “personal,” but in truth they’re HTML emails that have all the benefits, bells, and whistles of a retail email minus the images. The claim: Not everyone has a smart phone! I send emails overseas and they don’t necessarily read email in HTML over there! I should send text! You should send Multi-Part MIME messages. It’s what you’re doing and you probably don’t even know it. Multi-Part MIME is a way of sending multiple messages rolled into one. And in fact, most HTML messages already include a plaintext part. A Multi-Part MIME email requires a minimum of two parts; certain ESPs and mailing platforms automatically take the text of the HTML and turn it into a plaintext part to create the second half of the MIME. This is fine in most cases. However, if you’re really concerned about the language, branding, etc., of the plaintext alternate—perhaps because you have documented proof that a meaningful share of your subscribers read text email, for example—then you should probably write that part by hand. The best part about MIME is that the email client will determine which part it’ll display: if the email client is capable of displaying HTML it will; if it’s an older client or set to display text, it’ll display that part. Problem solved. The claim: Doesn’t sending a two-part email create a massive file?! Hardly. Even highly-designed HTML emails are generally lightweight, particularly given the modern predilection for mobile-centric and responsive design where less is more. Including a text part, even with a fully responsive email that may have extra HTML code to make it such, increases the size by a miniscule amount. Most broadband and mobile carriers have sufficient bandwidth where no one notices a slightly bigger file. Added bonus: there’s a filter in Spam Assassin, a common of the shelf email filtering tool, that actually looks for broken MIMEs, e.g. an HTML part without a TXT Part, or vice versa. It’s imperative to send both parts so you don’t break the MIME standard and as a best practice. Ultimately, giving up functional benefits like these means giving up key building blocks for driving user engagement. And the importance of user engagement is something about which there should be no debate at all.